TEHRAN, Iran Iran's president sneered on Tuesday at Israel's presentation at the United Nations last week, calling the cartoon-style drawing of a bomb held up by Prime Minister Benjamin Netanyahu "childish and primitive." Mahmoud Ahmadinejad said the drawing of a red line to urge swifter international action against Iran's nuclear program was an intellectual insult to U.N. dignitaries. "Red line, white line, black line and the like is for children. This is the level of this guy's character," Ahmadinejad said at a news conference in Tehran. "It was a primitive drawing, an insult to the audience ... it was a very ugly behavior." The Iranian president used the packed press conference to accuse Netanyahu of being a war-monger, saying of him: "Whoever talks of war is retarded." At his speech last week before the U.N. General Assembly, Netanyahu flashed the diagram of a bomb with a lighted fuse to illustrate progress Iran has made in its nuclear program, saying the country was approaching a threshold Israel could not tolerate. 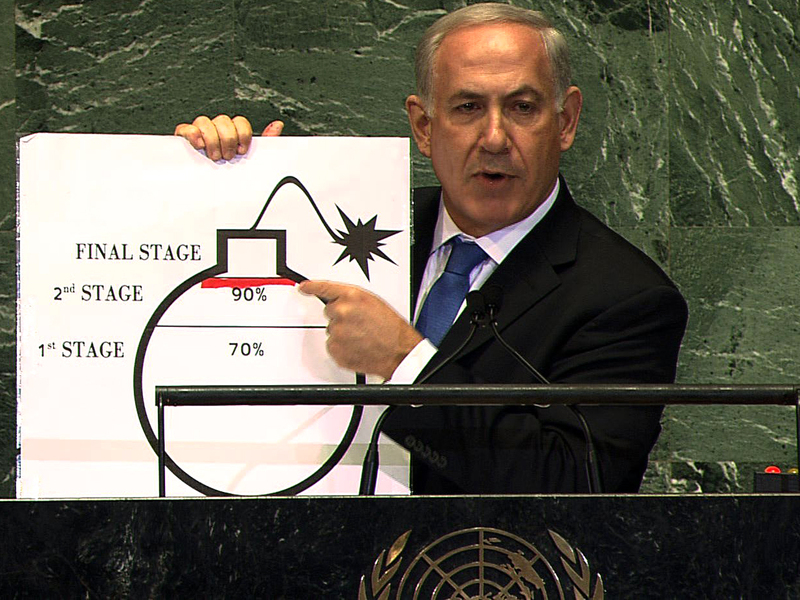 Netanyahu's prop was quickly dubbed "Bibi's bomb" after his nickname. Netanyahu has repeatedly argued that time is running out to stop Iran from becoming a nuclear power and that the threat of force must be seriously considered. Israeli leaders have issued a series of warnings in recent weeks suggesting that if Iran's uranium enrichment program continues it may soon stage a unilateral military strike. Israel and the U.S. have accused Iran of using its civilian nuclear program as a cover to develop nuclear weapons. Iran has denied the charges, saying its program is peaceful and geared toward generating electricity and medical radioisotopes to treat cancer patients. President Barack Obama has vowed to prevent Iran from becoming a nuclear power but has rejected Netanyahu's demands for setting an ultimatum - or red line - past which the U.S. would attack. His administration has urgently sought to hold off Israeli military action, which would likely result in the U.S. being pulled into a conflict and cause region-wide mayhem on the eve of American elections. At the Tuesday news conference in Tehran, Ahmadinejad joked that Netanyahu's artwork would improve with practice. "It appeared that his drawing was not good. He got it drawn by a machine. His drawing will get better if he makes more practice."